I can’t tell you how much I enjoy having a thumb drive: it carries with it just about everything that I want to have access to, such as backup documents, pictures, videos, and miscellaneous files. But that’s only half the story. 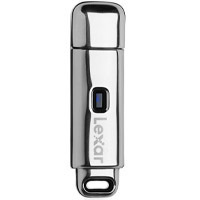 Truth be told, my shiny USB (2GB Lexar JumpDrive Lightning) is also my portable lab. You see, I like experimenting with new online toys–there are tons of waiting-to-play-with online services in my del.icio.us & BlueOrganizer links–but I also don’t want to install something that may change or tweak current programs in my computer. Instead I download the file to my trusty USB and experiment with it, instead of my computer. That way your regular computer settings won’t be exposed to the quirks and tweaks of new programs. For example, I wanted to try the new beta version of Firefox (currently 3.03b) but didn’t want to mess with my current list of add-ons, so I downloaded it to my thumb drive and away we went to play. As an aside, this latest edition of Firefox is quite fast, even running on a thumb drive, which usually lags behind a few seconds, performance-wise. But don’t expect many of the really useful add-ons to work with it yet. Other experimental things I carry in my portable mini-lab to experiment with are Flock Beta, Opera, and Avant browsers, and the image-editing open software GIMP, all USB-friendly thanks to the wonderful repertoire of portable applications available at Portable Apps. In fact, you can download a complete software package (Firefox browser, image editing, password savers, chat, the Open Office suite–in itself a fully featured package–and a whole bunch more) for a total of 260 MB of space. USB/thumb drives are not merely storage devices, but fully featured tools capable of keeping your life on the go, safe from interesting but weirdo programs. Update: PortableApps has released a side-by-side of its latest portable Firefox 3, beta 4–while keeping your “old” and stable version within the same folder.